Verdict: 3.75 / 5If you’re looking for an easy and fun to read, Amazing Spider-Man: Renew Your Vows #19 gives you a break from some of the darker stuff out there. This is the breath of fresh air we needed. 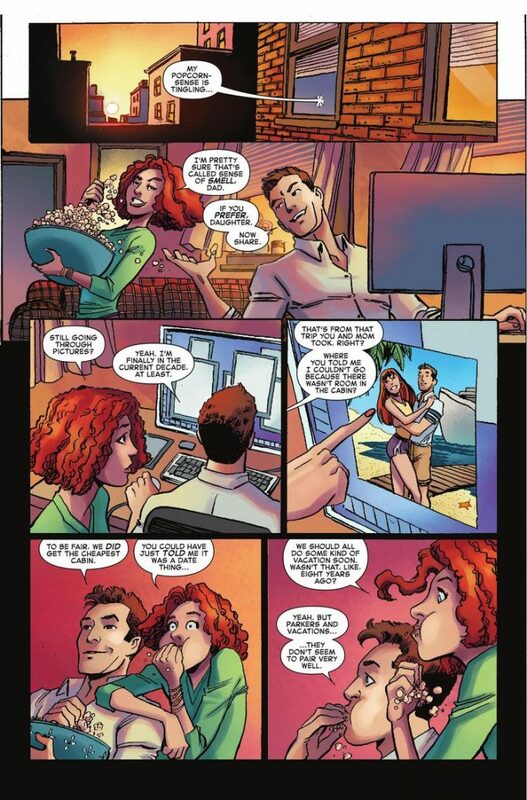 Amazing Spider-Man: Renew Your Vows #19 is a standalone issue that highlights the fun of the Spidey world. It’s a nice step back from all the dramatic longer form storytelling over the past few weeks, instead focusing on some family drama and heavily relying on comedy. Tackling the Spider clan of Earth-18119, this alternate world is created as a land where the events of the first Civil War never took place and, instead, Spider-Man and Mary Jane have a kid named Annie. Both Mary Jane and Annie also have Spider powers, much like Peter and take on the name Spiderling and Spinneret. After battling countless foes as a family, Annie and Peter are reminiscing about a time when things were slightly simpler. When Mary and Peter actually managed to go on holiday and relax for a bit. We then flashback to this time where they both realise they need a bit of a break, although, as we learn, this would be the last holiday they go on for a while. Upon entering the cruise, they realise it might not be for them, with the ship being full of snobs. Peter quickly gets antsy but is relieved to find a sea monster attacking the ship. The subtext of this issue was the resistance of some of the passengers against the heroes, claiming that all the threats to Earth are a conspiracy for the heroes themselves to thieve and plunder. Both Spinneret and Spider-Man leap into action to battle this creature, only to find Namor protecting this beast of the ocean. We then find an amusing interaction between The Sub Mariner and the Captain of the ship, before Mary Jane and Peter are back on land, regretting ever going on the holiday at all and swearing off cruises. The subtext of this issue was the resistance of some of the passengers against the heroes, claiming that all the threats to Earth are a conspiracy for the heroes themselves to thieve and plunder. A minor racist undertone throughout this piece was very interesting but not overplayed. The focus on family was the main focus of issue 19 and the concept of heroes just taking a break and this showed. The workings of a heroes life, including Wolverine babysitting Annie, led to a few laughs and gags but also makes you think about the incredible lives these heroes lead. The art captured the fun of the writing and the colour of this Earth, a more carefree environment. There are of course threats throughout this version of Spidey’s life but he seems much more at peace in the world of superheroism alongside his family. Amazing Spider-Man: Renew Your Vows #19 is a breath of fresh air compared to other titles out there. It isn’t necessary to have the end of the world stakes every time you pick up a comic. Sometimes slowing it down for a bit, allowing for some laughs and taking a different look at a likeable character is really useful for a fun read.